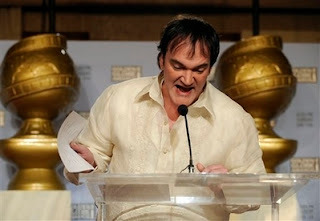 Director Quentin Tarantino, a recent Manila visitor, announces a nominee to the 65th Golden Globes Awards (above). At right, QT with actors Ryan Reynolds and Hayden Panettiere. Of course, he just had to wear his sneakers with it, which kinda threw off what would have been a really distinguished look for him. But then, if he had worn leather shoes, the look wouldn't been trademark Tarantino. At least he wore a white T-shirt underneath. Coolness. A lot of foreigners like the barong because it lends them the right elegance they need for any formal gathering without being so constricted the way the traditional American business suit does. Besides it is light, cool (in an airy sort of way, not cool as in kewl), and easy to pack. Anyway, this was great exposure for the Philippines' traditional menswear. So huge props to QT for putting his mark on it. to think that barong was tagged as a peasant dress during the asean summit in australia this year... to each his own. Quentin was gifted with a "TESORO'S" barong (www.tesoros.ph) by the National Commission of Culture and the Arts Executive Director Cecilia Guidote-Alvarez and by the Film Development Council of the Philippines vice-Chair Christine Dayrit. The Director was presented the 24 hour executed, custom-made barong for his courtesy call to the Philippine President Gloria Macapagal-Arroyo.